Is the Megalodon Shark Alive Today? The Answer is a Resounding NO. Faked megalodon image used on a Discovery Channel fake megalodon documentary. The original image is a screencap of archival footage of U-boats in the Atlantic. This website has a very nice Megalodon information page. It has everything you wanted to know about the giant megalodon and it's cited with scientific journal articles. Unfotunately, due to an influx of fake documentaries, and odd youtube videos, and the new move "The Meg" people are believing megalodon is alive today. They are looking for evidence presented on popular fake documentaries and videos about megalodons. These fictional documentaries, meant to mislead the public, include the 2013 "Megalodon - The Monster Shark Lives," the 2014 Shark Week sequel, "Megalodon: The New Evidence ," the "Shark of Darkness: Wrath of Submarine ," "Voodoo Shark," and others. The "marine biologists" that gave their "expert" opinions on the shows are not real people. The fictional biologist Collin Drake is played by the actor Darron Meyer, and Madelyn Joubert is played by the actress Juliana Venter. Even the "witnesses" on the shows are actors and actresses. Unfortunately some of the shows include real scientists. These scientists, such as Jonathan Davis shown on "Voodoo Sharks" say they were mislead during the interviews as unrelated questions he answered were edited together. Kristine Stump from The Shedd Aquarium of Florida said something similar about the mokumentary "Monster Hammerhead." She said the producers wanted updates on hammerhead shark research but the film doesn't match what they filmed. This unethical interview practice that duped many scientists is downright dangerous to the scientific community. The whale with its tail bitten off in Hawaii in 2009. The whale photo and video never existed, it's all CGI. The "declassified" U-Boat image from 1942 showing a giant fin and tail in the background is fake. This photo was doctored for the show. George Monbiot, a Guardian columnist, found the original footage. It's a screen shot from an archival U-boat film. The people fishing near Cape Town who's boat was attacked by a megalodon and died in April of 2013 never existed. This is a completely fabricated story complete with actors as the crew and news castors. Since these fictional documentaries, where science was removed and fiction was inserted are fairly popular, many people now believe in bizarre shark and sea monster tales, including that megalodon is still alive. The answer to the megalodon question is a resounding NO. Megalodon went extinct around 3.5 million years ago. Although the Discovery documentaries on megalodons are entirely fictional, there is a real documentary about the megalodon that's much more accurate and educational. It was produced by National Geographic. It's called Prehistoric Predators: Monster Shark . This movie is lesser known but MUCH more accurate. I highly recommend it if you are seeking the truth about Megalodon. Reports of the "HUGE 9 foot Great White being eaten whole by an Unknown Super Predator"
A research team in Australia tagging Great White sharks found one of their tracking devices washed up on shore 4 months after tagging a Great White. When analyzing the data, they found a temperature rise and a sudden 1,900 foot drop in depth. The only logical explanation was the shark was eaten by something and the tracking device was in the predators digestive track. This part is true. Unfortunately, headlines circling the internet are incredibly skewed. The mention a "Huge" 9 foot Great White, a "mystery sea monster", a new "super predator", etc... People reading these misleading headlines can easily come to the assumption that a giant Megalodon shark ate the Great White. However, if one looks at the science, there is a much more clear and logical explanation. A larger Great White ate the Great White. The researchers even say this, unfortunately, most of the internet articles stopped before mentioning this. Videos and pictures of giant dead sharks washing ashore, or seen swimming near a boats and/or people. These must be megalodons. Odd things wash ashore from time to time! Partly decomposed whales and large sharks make for good sea monsters. The image below is a classic one. This engraved image from the October 24th, 1868 edition of Harpery Weekly titled "The Wonderful Fish, Caught Near Eastport, Maine, Aug. 3, 1868" shows a creature washed ashore. It is most likely a basking shark with artistic touches (nice legs!). Videos and images of giant sharks do exist. Many of them are real. The reason is because there are large sharks, similar in size to what megalodon was, that exist today. 60 feet is stretching it for a maximum size of a megalodon. 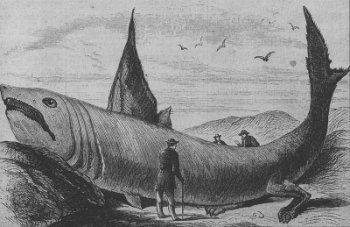 The average size of a megalodon was around 30 feet (see the Megalodon Size Page for cited size information). Other large sharks can reach simlar sizes today. Two of these sharks are the Whale shark and the Basking Shark. Whale sharks can reach lengths of around 40 feet, which is similar to a Megalodon. However, they have a distinctive wide and flat appearance. They are black with white spots on them. However, the other large shark, the basking shark, has been mistaken for the giant prehistoric beast. These GIANT, yet harmless, creatures can grow to almost the same size as a megalodon. Basking sharks inhabit coastal waters and feed on plankton. These docile sharks can grow up to 40 feet, which is similar in size to an adult megalodon. On the rare occasion when these beautiful creatures are spotted by beachgoers, they can easily be confused with a megalodon by someone with an overactive imagination. Just because a giant shark is sighted doesn't mean it's a prehistoric megalodon, it could very well be one of these amazing basking sharks. A classic example is shown in the Harpers Weekly image above and another good example is shown below. 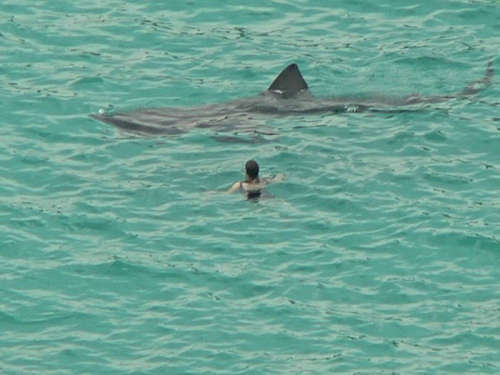 This amazing photo is of a Basking shark swimming near a beachgoer. Basking sharks can easily be misidentified as a megalodon by people with overactive imaginations. Image courtesy of candiche. If a megalodon body washed ashore today, or one was videotaped or photographed swimming around, it would make instant global news and not just news in the conspiracy annals of youtube. This is a popular piece of evidence used. However, there have NEVER been any recent megalodon teeth found. The most recent ones are still over 2 million years old. The origin of "recent megalodon teeth" started in the 1950's. Megalodon teeth were found in the South Pacific from dredging along deep 1000 foot slopes of a fringing reef around New Caledonia. The enamel on many of these teeth are leeched such that a white color was left, making them slightly resemble a recent tooth. The type of age dating done in the 1950's was Manganese dioxide dating. The Manganese dioxide dating gave an age range of the sampled teeth to be between 11,000 and 24,000 years old. This type of manganese dioxide dating is now considered invalid, due to the teeth being eroded out of their original formation and re-deposited. Today, modern dating methods indicate the teeth are eroded from a Miocene formation, which is between 23 and 5 million years old. Any source that uses the "evidence" that teeth pulled from the South Pacific are 11,000 to 24,000 years old are purposely misleading the reader by using invalid and outdated evidence. On a side note, these beautiful fossil megalodon teeth use to be dredged from this area by the boatload. In 2003 the French pulled the permit for dredging in this area. Today these beautiful New Caledonian fossil megalodon teeth cannot be collected. If a recent megalodon tooth was ever found, Paleontologists and marine Biologists would have a field day publishing new journal articles. These scientific and peer reviewed articles do not exist. Megalodon evolved into a deep sea predator and is still roaming the deep seas. There is no scientific evidence of megalodon evolving into anything else. Evidence suggests it went extinct approximately 3.5 million years ago with many of the large marine animals during the mid-end Pliocene. Let's start this one by looking at megalodon origins. Although the fossil record can be spotty and there are gaps, the fossil record for shark teeth in tertiary deposits is actually nearly complete. Scientists have a very nice evolutionary history of the megatooth sharks starting way back in the cretaceous with the shark Cretolamna appenticulata. As time goes on, there is a clear fossil record of slight changes in the shark teeth. The cusps gradually become smaller and dissapear. Cutting edges become serrated, the crown gets broader, and the overall size of the teeth increases over time. Paleontologists assign each change of the megatooth shark into new species, and even genera, until the high mark is reached; Otodus (Carcharocles) megalodon. Yes, there is debate over exact species names, genera names, and when one morphological form is pronounced enough to be considered a new species. But everyone does agree, the fossil record is very clear and complete when it comes to the evolutionary history of megalodon. The extinction of megalodon also is clear in the fossil record. Fossils of megalodon are plentiful, but at the mid-end Pliocene, they vanish. This doesn't mean there are not marine Pleistocene formations. There are, and they are plentiful. They contain an array of marine fauna, including many surviving sharks and surviving whales. They just don't contain megalodon fossils anymore. There are no transitional fossils showing a gradual change of megalodon into something else, there simply are no fossils of megalodon or similar creatures. If megalodon changed into something else, there would be a clear record in these well studied Pleistocene formations. There is no record, they completely vanish. The only valid conclusion is megalodon became extinct. This shows the evolution of the megalodon, from a small Cretaceous shark to the apex predator of the Pliocene. After the Pliocene, megalodon fossils are no longer present. The Oceans are so vast and mostly unexplored; a large predator can easily evade detection, so megalodon can exist. This is probably the most commonly used argument. That's because the statement is partially true. The oceans are vast and a large predator can evade detection. Unfortunately, the statement contains a common logical fallacy called the "Argument from Ignorance". This common logical fallacy states since we don't know or can never prove whether a claim is true, it must be false. Scientists are always finding new deep sea creatures. However, the evidence for megalodon is not there. There could be space aliens under the sea, there could be unicorns, dragons, Elvis, Jimmy Hoffa all living in some underwater castle yet to be discovered. However, the evidence for these are also not there. Lets look at the scientific evidence. Megalodon is just not any oceanic creature. It was THE top apex predator of the oceans. The evidence is not there for a large undetected apex predator ruling the oceans. I'm sure there are plenty of other undetected animals, including new species of sharks roaming the oceans, but none of them are going to be a top apex predator like the megalodon. If megalodons were alive today, we would be seeing them, ALL THE TIME. Unlike many sharks, Megalodon was a warm water animal. Fossils are only found in ancient warm water oceans and seas, not near the poles. They used nursing grounds that were near shore, the East Atlantic Coastal Plain and Florida were two such nursing grounds. Juveniles would live and grow there. They ate cetacea (whales), and lots of them. They were common. 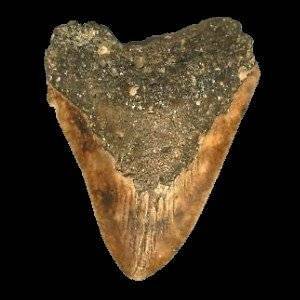 Megalodon fossils are found nearly globally in all warm and temperate waters of the Miocene and Paleocene. These were not rare animals, their fossils become relatively abundant during the Miocene and Pliocene, more so than the Great White sharks. If megalodons still existy, we would be seeing them ALL THE TIME. These top apex predators would be spotted eating whales on whale watching tours, they would be spotted by recreational boaters in the nearshore coastlines. There would be a whole "megalodon watching" and "megalodon diving" tourist industry centered around them. Carcasses would be washing ashore from time to time (like the basking sharks). They would not be hiding in the deep, cold, dark depths of the sea. These animals were in no way designed for that. Megalodon was THE top apex predator of the oceans. The modern ecology of the oceans cannot support such an apex predator today. A major event occurred toward the end of the Pliocene which caused a mass extinction of large marine animals. Factors include global cooling and changing ocean currents due to the closing of central america. This completely shut down the tropical currents connecting the Atlantic and Pacific Oceans and completely changed temperatures, currents, and nutrient flow of the Oceans. Since megalodons were warm water animals, this event stopped megalodons from swiming between oceans. Megalodon populations became isolated in "islands of warm water". Ice Age cycles were triggered during the cooling in the Pliocene. Ice sheets caused water to become locked up at the poles, causing a dramatic drop in global sea levels. Nearshore megalodon nursing areas were lost. All of these events caused a major disruption in marine fauna, especially megafauna, like whales and sharks. Whale diversity (megalodons main food source) drasitcally shrank. Many whale genera became extinct, including the cetotherids that were a main food source. The few whales that survived adapted and started migrating into cooler, more nutrient rich waters where megalodon could not go. Other whales adapted into large killing apex predators that hunted in pods, such as the Orcas. Juvenile megalodons would have made for tasty Orca snacks. All of these massive ecological changes above spells disaster for any top apex predator. When an ecosystem collapses, the first animals to go are the ones on the top of the food chain. Today, the limited warm ocean waters are not nutrient rich enough to support a large apex predator like megalodon. Also there simply are not enough cetacea to support the feeding habits of megalodon. There are also no more nursing grounds left for megalodon. Summing this all up, megalodons habitat is gone, it's food source is extinct, and there are now other (smaller) apex predators in the oceans occupying megalodons niche. There is simply no room, ecologically speaking, for a megalodon to exist. So, to sum everything up... Megalodon is NOT alive today, it went extinct around 3.5 million years ago. Go to the Megalodon Shark Page to learn the real facts about the largest shark to ever live, including the actual research about it's extinction. The following book: Megalodon: Hunting the Hunter is an impressive book about megalodons. This informative book is easy to understand, filled with interesting facts and has many high quality images. It's a must for any "Meg" fan! This compact book is a great read for anyone interested in collecting fossil shark teeth in Venice. It gives tons of information and tips for beginning collectors, the reason why fossils are there, and identification. It's a great resource book. Apparel: Megalodon T-Shirts from Megalodon Mad Gifts 4 U. If you're looking for something uniquely MEGALODON, these guys have a bunch of cool shirts! They come in a bunch of colors, styles, and sizes. There are enough designs for even the most discerning megalodon fanatic! These are Authentic Megalodon teeth sold by Fossil Era , a reputable fossil dealer (that I personally know) who turned his fossil passion into a business. His Megalodon teeth come in all sizes and prices, from small and inexpensive to large muesum quality teeth. Each tooth has a detailed descriptions and images that include its collecting location and formation. If you are looking for a megalodon tooth, browse through these selections! 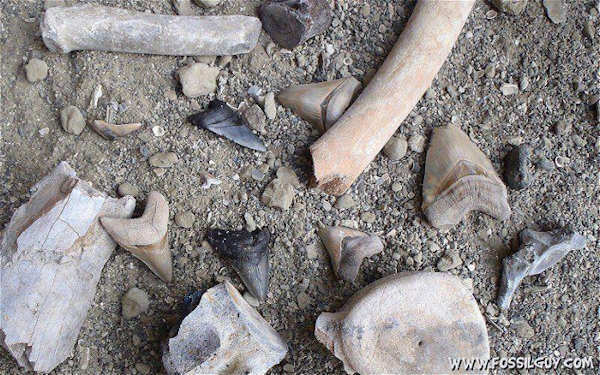 How big was that shark your meg tooth came from? Florida Megalodon Fossil Hunting Site.